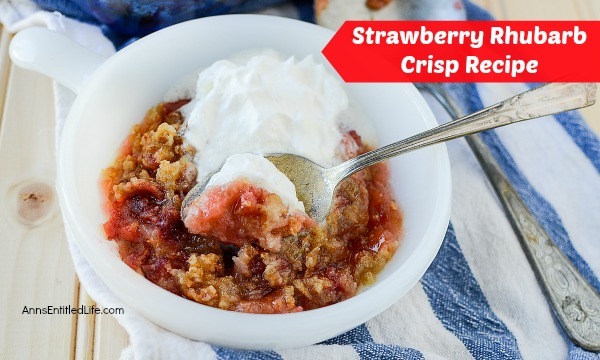 This Strawberry Rhubarb Crisp Recipe is really, really good. The brown sugar almost caramelizes (there is a lot of butter in this recipe!) and forms a wonderful topping with the oats. You could actually use granola instead of rolled oats to give a sweeter taste (granola was used in these photos). It is very easy to make. Just make sure to use a pastry cutter (blender) to blend the dry ingredients together with the butter. Note: this recipe first appeared on my old blog in 2010. The photographs have been updated. • Preheat oven to 375º. • Lightly spray a 13″ x 9″ baking dish with nonstick spray. Set aside. • In a large bowl combine granola (or oats), butter, brown sugar and 1 cup flour until crumbly. A pastry cutter (blender) works well for this task. Set aside. • In a separate bowl, combine hulled and sliced strawberries, diced rhubarb, white sugar and 1/3 cup flour together. 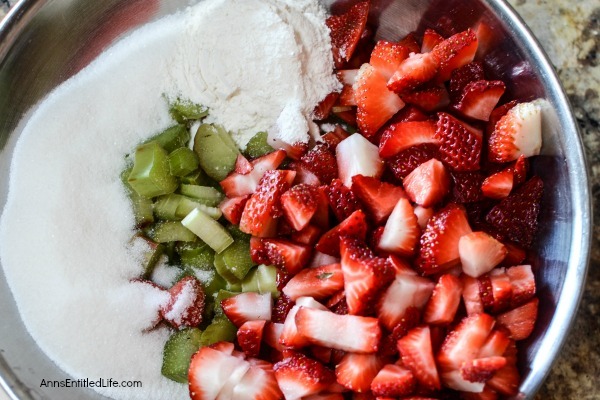 Mix well by folding until the strawberries and rhubarb are completely coated. • Spread fruit mixture in the prepared baking dish. 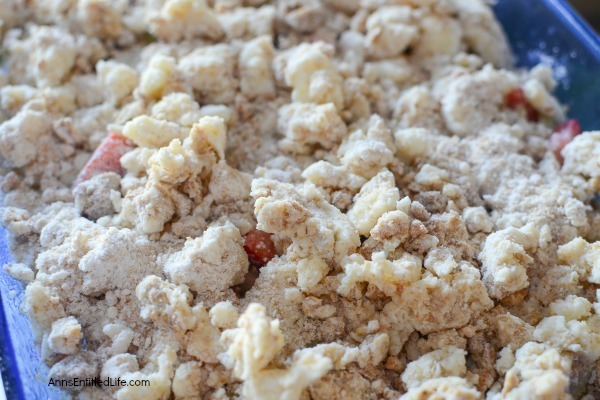 • Top fruit mixture with granola (or oats) crumbles. • Bake for 45 minutes in a preheated 375º oven. • Serve warm or cold, plain or topped with vanilla ice cream or real whipped cream. 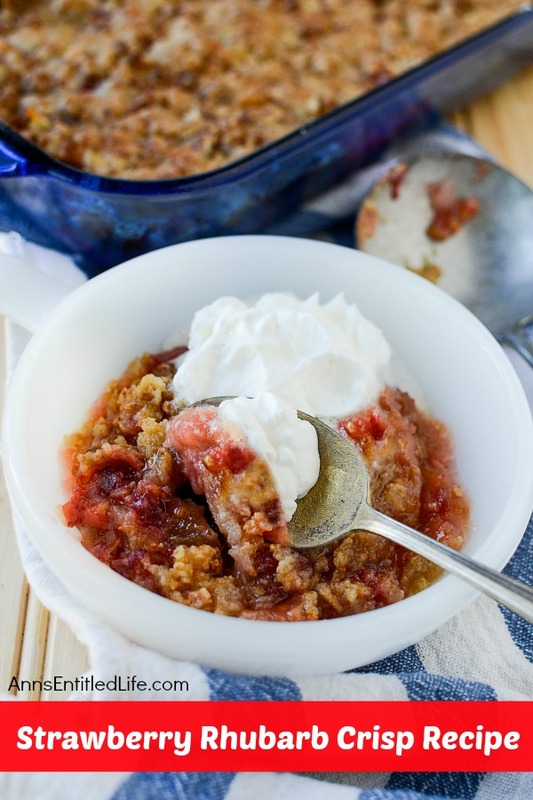 This updated, old time strawberry rhubarb crisp is simply delicious. The great sweet-tart taste of strawberries and rhubarb combined with a buttery good granola crumble topping makes for a dessert your entire family will enjoy! • Have extra rhubarb!? 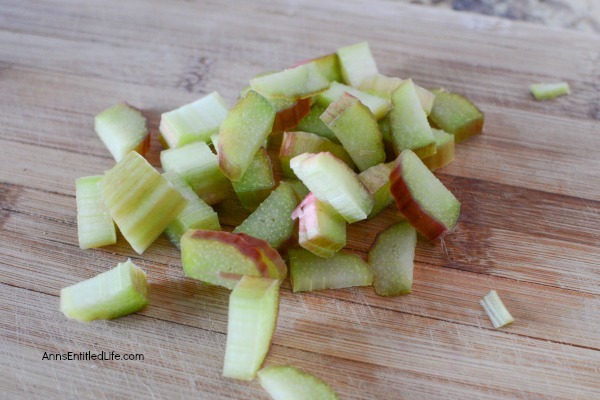 Learn How to Freeze Rhubarb with these easy step-by-step instructions. • Strawberry Rhubarb Galette Recipe – when a little crust will do ya. A fast and simple strawberry dessert. • Strawberry Tart Recipe – forget complicated strawberry tarts, this one is simple to make, yet gives the dramatic beauty of a much more complicated tart recipe. • Strawberry Breakfast Sandwich Recipe – this is simply AMAZING!! So darned good. 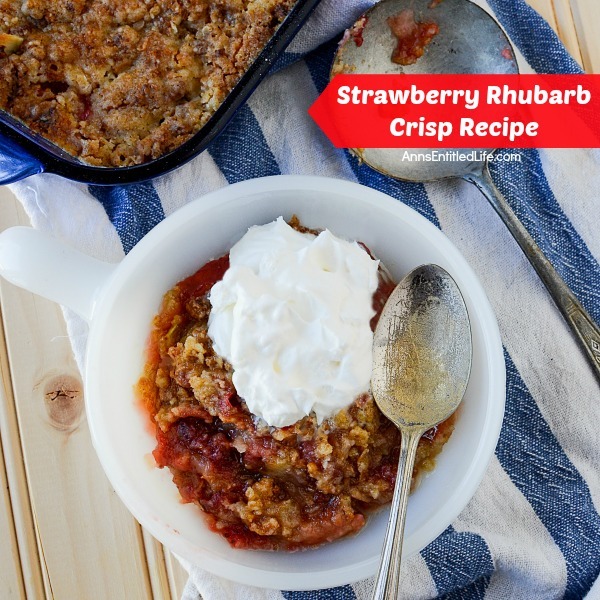 • To print the Strawberry Rhubarb Crisp recipe, click here. Sounds good.. and that red & green together look great.. It is good Kim – give it a go! I baked this today following the recipe to a “T”. Turned out great! I will however cut down on the 3 sticks of butter it calls for. I’m think 1 stick would make things way more crumbly. With three sticks it’s like working with cookie dough. I even added a extra cup of granola.